Ronnie and Reggie are a pair of 8 month old Boxer X brothers who are looking for separate homes where they will get some individual attention and training. Experienced homes only will be considered as these lads need basic training and socialisation. In the photo above Ronnie is on the left (he has a dark tail) and Reggie on the right (he has a lighter tail). 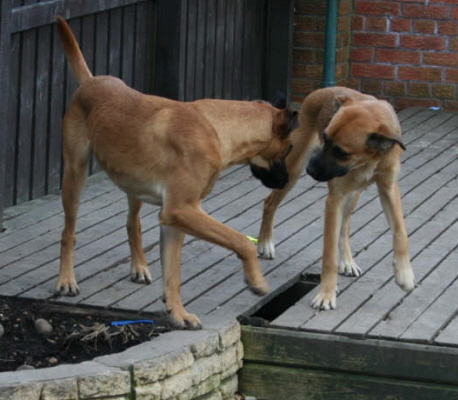 The boys have been living with their owner, who also owns their Mum, a Boxer. Dad is believed to be a Labrador Cross. They are house-trained. The boys have never been lead walked, so will need to be taken right back to basics with patient and calm introductions to all of the socialisation they have missed. 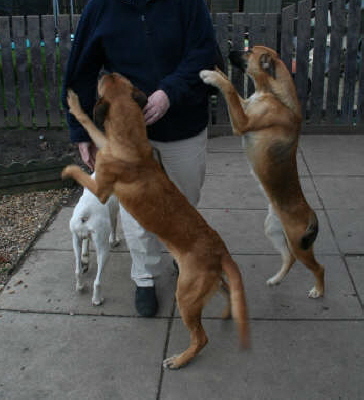 From assessment we know that these lads are extremely friendly and affectionate, very bouncy and energetic and love to play. They are handsome looking boys of medium height and slender build. They are used to sleeping in the kitchen at night with each other for company, and can be left for short periods as they are not destructive. 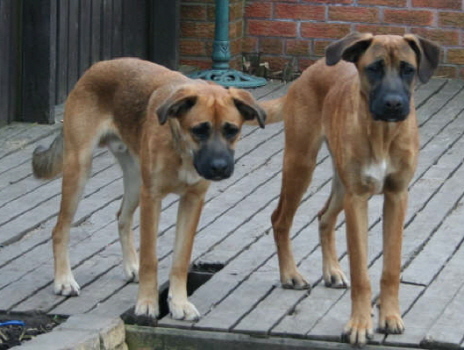 We know that Ronnie and Reggie will make wonderful companions in the right home. Is that yours? Anyone interested in rehoming Ronnie or Reggie needs to contact us or telephone Clare on 07929 478634 for an informal chat. If successful an adoption contract is completed and a donation is usually required. The dog will be neutered or spayed, vaccinated and micochipped.